Denim fabric is wonderful as it looks great, is extremely durable and keeps us warm during winter and cool during the summer. All of us have old denim jeans we have either out grown, torn up or they are just out of fashion. 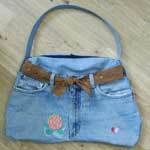 Don't add to your area landfill by throwing old jeans away but instead make something new out of something old. If you don't have old jeans you can buy them cheap at thrift stores. 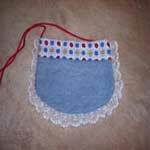 Here are really cool patterns for an awesome 3 ring binder cover with pocket, denim pocket purse that's a hit with little girls and a trendy split jean skirt. 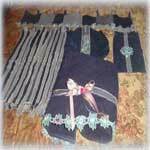 These and many more blue jean patterns to choose from. 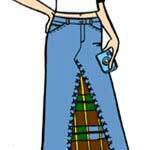 Read how to make a good looking split jean skirt using an pair of torn or old jeans. Don't throw away old ripped jeans, instead convert them to something you can use. 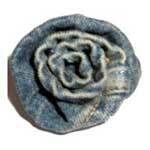 A cool way to start a fashion trend when you pin this unique demin rose to a jacket or hat. 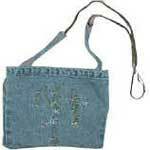 A quick sewing project that makes a purse which is perfect for a young girl to carry. 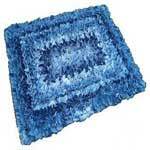 A denim rug recycled from a variety of thinner denim fabrics and really cool looking. 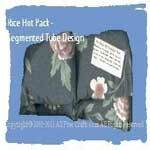 Inexpensive and easy to make, these bathroom accessories look great in any bathroom. You can add small amounts of herbs or a few drops of your favorite herbal essential oil. This is a very 70's look that the kids seem to really be into right now. 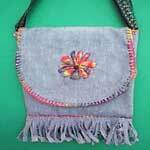 This project typifies style and spirit of the hippie age and so easy to make.